This salad is rich. To the point where you do not have to pair it with any protein. A perfect vegetarian option for those nights you want to skip meat. I try doing that at least once a week. Some days are better than others. ha-ha! I am a meat person, what else can I say? Slowly, Lola, slowly. Rome wasn’t built in one day. You will get there with practice, I say to myself. Let’s get back to this salad recipe. There are plenty of brussels sprouts salads out there. For most of them, you need to cook the sprouts one way or the other. I’ll be honest with you, I am not very fond of cooked brussels sprouts. Very rarely will I find them cooked properly (not to mention cooking it properly myself), without pushing the sprouts to the point of no return. Have you noticed that overcooked brussels sprouts have that very bitter taste? So I developed this recipe where brussels sprouts go in raw. It gets complimented with a slew of other ingredients, which make this salad a literal bomb-dot-com. Here my 12-year-old would correct me on my usage of “literal” wrong! 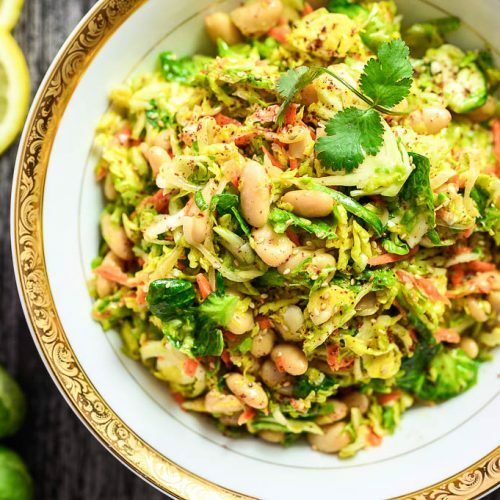 The salad is very easy to put together and is a very good way of going through brussels sprouts very quickly. That is in case you are like me. You buy a huge bag of brussels sprouts from Costco (not to mention that bag of broccoli, cauliflower, and spears of asparagus?) and wonder if you will ever use it up before it ends up in a trash can. Let’s prevent that, shall we? 1 tsp gochugaru (Korean chili pepper) or Aleppo peppers. Just because these peppers are mild. 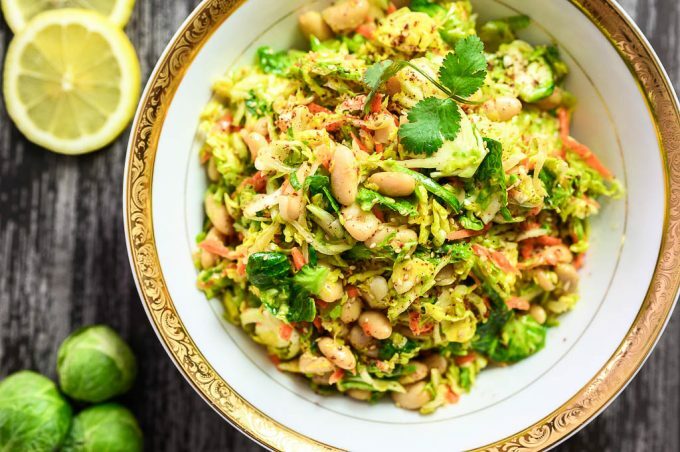 Grab your mandoline and slice the brussels sprouts thinly. If you use the shredder handle that comes with the mandoline it is super easy to slice these guys thinly. 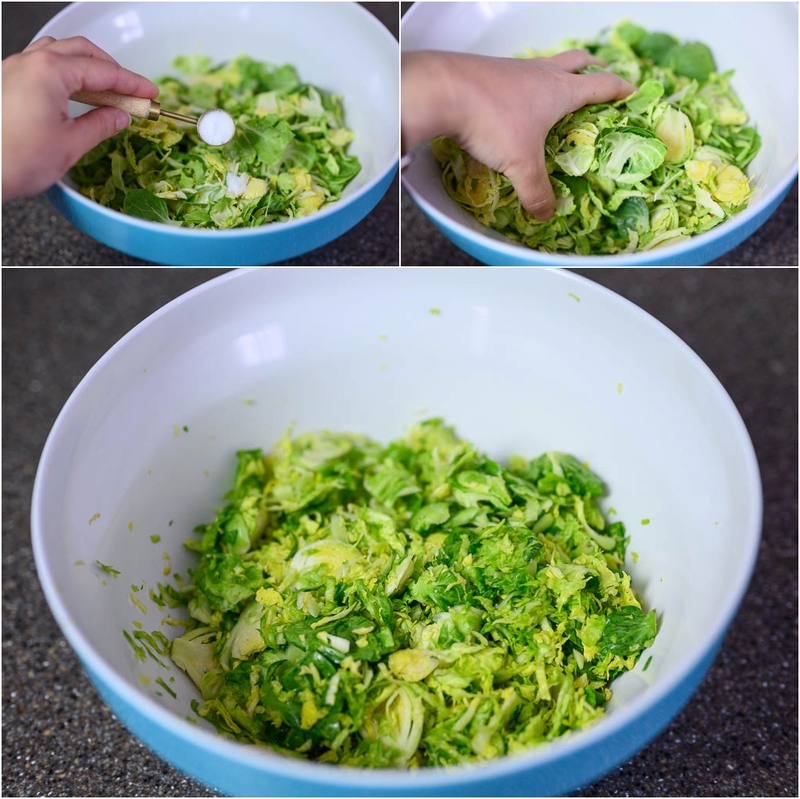 Place the sliced brussels sprouts in a medium bowl. Add 1 tsp salt and squeeze the sprouts until they are wilted a bit. Set aside. 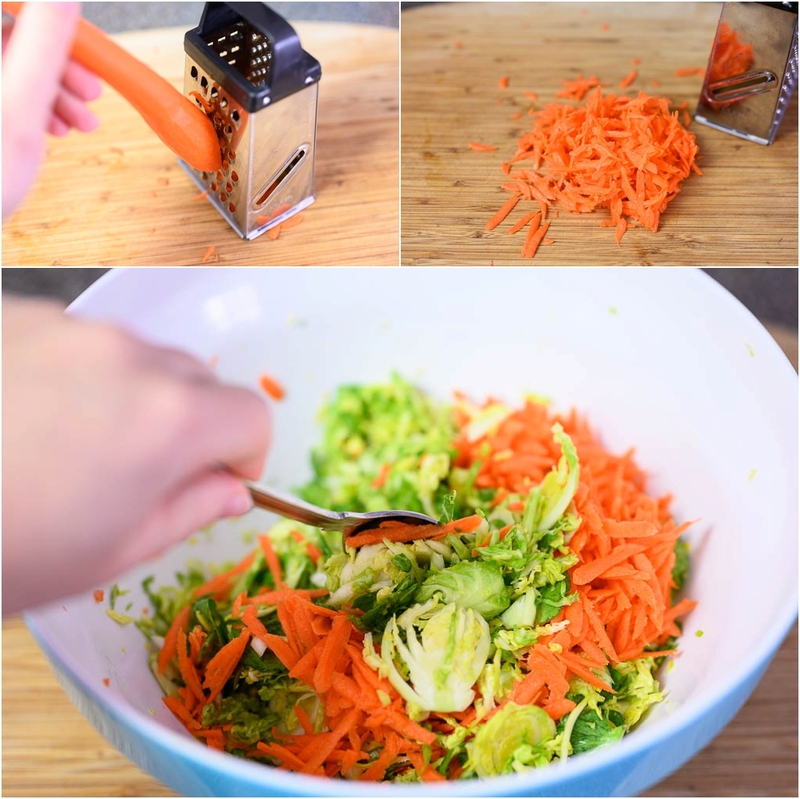 Using a grater, grate the carrots and place them in the same bowl with the brussels sprouts. Give it a whirl with a spoon and set aside. Chop up the garlic clove and place it in the bowl. 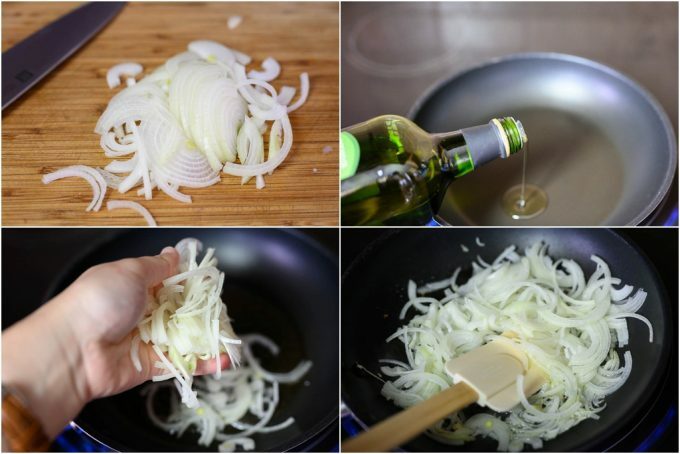 Slice onions thinly. Heat up a small skillet, add 2 TBSP olive oil. Add onions in the skillet and saute on medium heat until slightly caramelized. Drain white beans nicely and add into the skillet. Saute for about 2 minutes until beans soak up some of the caramelization of the onions. Turn the heat off and set the skillet aside until the beans are needed. Add gochugaru, sumac, tahini, lemon juice, vinegar, and black pepper in the bowl with the brussels sprouts. 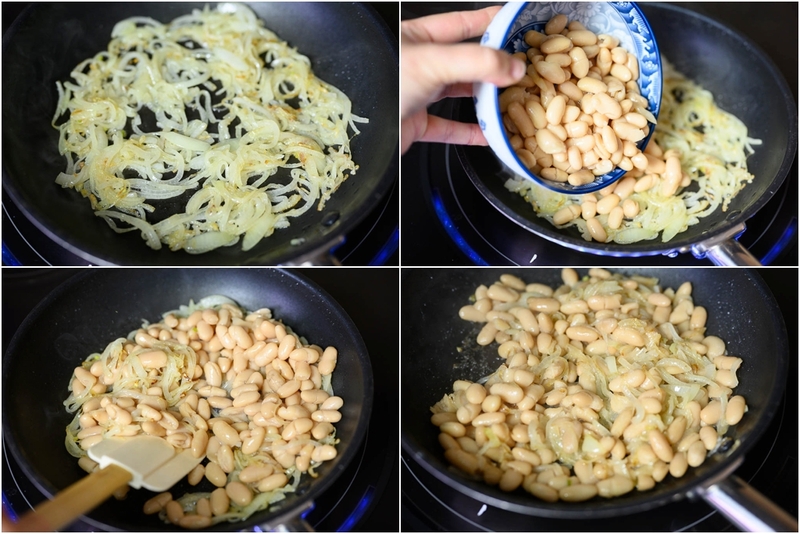 Incorporate caramelized onions and beans into the bowl. 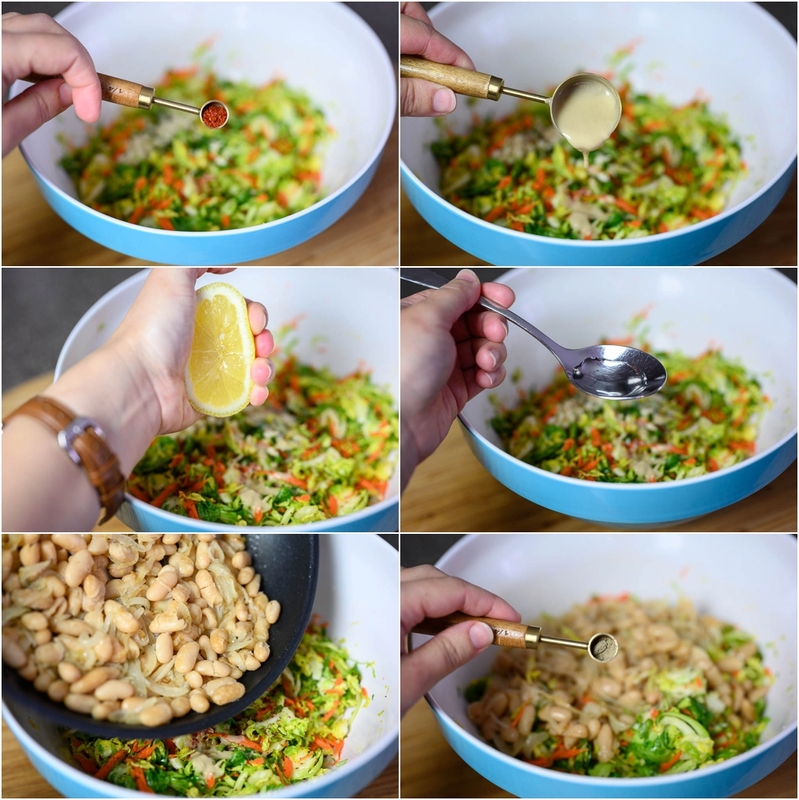 Gently mix everything together and your salad is ready to serve. I had half of the salad left for the next day and the taste didn’t budge a bit. If you want to use it as a meal prep idea, this will work out quite well. Let me know if you have any questions. Let’s brainstorm together! 1 tsp gochugaru Korean chili pepper or Aleppo peppers. Just because these peppers are mild. Gently mix everything together and your salad is ready to serve. I had half of the salad left for the next day and the taste didn’t budge a bit.